Preventive dentistry is the best way to avoid painful, expensive dental procedures as it stresses at-home dental care that will help prevent decay or disease. Preventive, or at-home, dental care is important because it results in healthy teeth and gums throughout one's life. Many at-home treatments can help prevent disease or decay including brushing your teeth at least twice daily, flossing, and using mouthwash. However, it's important to know how to floss and brush properly. Proper brushing techniques include using a soft, nylon toothbrush with round-ended bristles. Place the toothbrush at the gum line at a 45-degree angle to cover the tooth surface and the gum line. Move the brush back and forth, gently brushing away any plaque or tartar from the surface of the tooth and the gum line. Patients should be sure to brush the insides and outsides of all teeth, including the hard to reach back teeth. Floss should be used to clean in between teeth. Proper flossing techniques include using an 18-inch strip of un-waxed floss wrapped around the middle fingers of both hands. 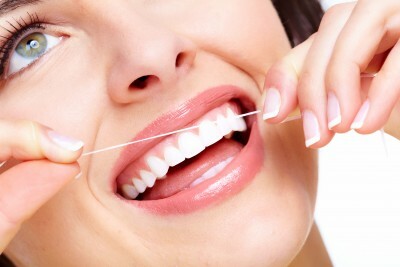 Insert the remaining 2 inches of floss between each tooth, using your thumbs to direct the movements. Gently scrape the plaque out from between each tooth. You should always floss below the gumline to remove any harmful plaque that is found under the gumline. Healthy smiles begin at infancy! Parents should begin brushing and flossing their children's teeth when the first tooth emerges. When the child is old enough, parents should teach their children to brush and floss. Setting a high standard of oral hygiene early on in life will help your child develop healthy oral hygiene habits for life!